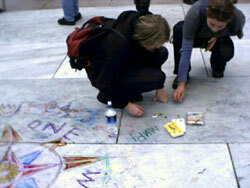 Compass roses -- drawn on the sidewalk in front of the White House and in front of a storefront mosque in DC; on Wall Street near where the World Trade Center stood and on 125th Street in Harlem; by the Grand Canyon and by the river Jordan; in front of the US mission to the UN and in front of the Iraqi mission. Each compass rose is different, yet they all point in the same directions. They will fade away, but they will still be true. Compass roses -- in subways and elevators -- where people are not cognizant that they are on "land" or part of the "Earth." All places are holy. We are inter-connected. The compass rose is an immediate symbol of the fact that we are all on the same planet; simultaneously global and local. It questions the ideas of separation of people from one another and of cutting up the Earth through the artificial notion of land ownership. It challenges the premise that any one place, City Hall or corporate headquarters, should rule over any other; that any nation should dictate to others. It takes this message to people -- to the street. We are all of the same family but we're not the same. 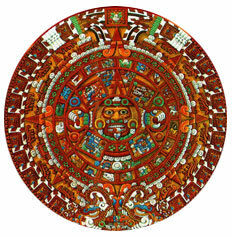 Many cultures have symbols that can be viewed as compass roses -- Aztec calendars (right), Buddhist Mandalas, American folk "hex" symbols, designs from the domes of mosques, other circular patterns -- representing the cycles of life -- from every culture under the sun. Of course, my compass did not "point north," rather it pointed along the south-north magnetic axis. I'm not interested in putting one direction "above" any other -- as most maps do for north. We need new symbols, we need a new language. Many symbols -- like the phrase "moral compass" -- have been co-opted. George Bush used the phrase to justify the first Gulf War and it is the title of one of William Bennett's books. The logos for Citibank, NATO and the CIA and can be seen as compass roses -- a globalism based on oppression, corporate, military and government power. But the true Globalism is based on our common humanity and care for the Earth.